That was one key message at a special Assembly meeting Wednesday addressing how individuals should be submitting claims to state and federal officials in the weeks ahead. Recouping losses to homes and property in the wake of a disaster involves multiple steps with insurance companies, as well as state and federal relief agencies. For the time being, Mike Sutton with Alaska’s Division of Homeland Security told Assembly members and the public that the state is trying to gather damage assessments from residents. The state wants people with damage to their homes and what’s deemed “essential personal property” to call a hotline or file claims online. That includes descriptions of the damage, the address affected, as well as insurance and personal information. Evidence, like before and after photos of impacted areas, is helpful. 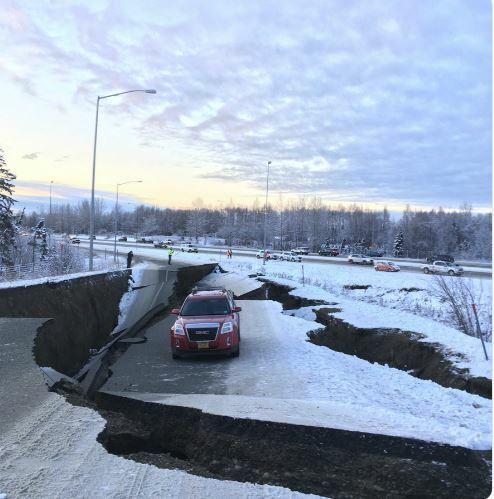 As the state of Alaska begins getting a picture of damage at the residential level it will give an aggregated assessment to the governor, who will then pass it on to federal officials with FEMA. The state has already received 1,800 applications for relief. But between now and January 29th, a major aim is getting resources to people who have been driven from their homes. It’s not clear yet how many people in Anchorage or the Valley have homes the earthquake rendered unlivable. But one of them is Ayyu Qassataq, who’s lived in her west Anchorage house for more than a decade. That determination was made by building inspectors, who told Qassataq it was unsafe for her to stay there. She packed a bag, gathered important items, and is now sorting out how to file her claims through insurance and government programs. She said it was helpful to hear from state and federal relief agencies in the Assembly’s forum, but knows it’s only the beginning of a long process. Residents are encouraged to submit their individual assistance claims online here. Or call 1-855-445-7131.